Tazo Passion Tea is a non-caffeinated, commercially produced tea that contains a number of herbs, including hibiscus flowers, licorice, cinnamon and rose hips. Each of those herbs has therapeutic value, according to Michael Castleman in “The New Healing Herbs.” Rose hips are rich in the antioxidant vitamin C, and laboratory research has found that licorice can successfully treat stomach ulcers. Consult a qualified health care professional before using herbal remedies for any health condition. Rose hips are the seedpods of roses. They are good sources of vitamin C, an essential nutrient for health. The rose hip has a tart flavor and imparts a crimson color to tea. According to a 2005 article in the “Scandinavian Journal of Rheumatology,” a research study concluded that rose hips may be an effective treatment for the painful symptoms of osteoarthritis. Consult a qualified health care professional if your condition is severe or persistent. Cinnamon is a warming and stimulating spice that is used as a remedy for digestive conditions including colic and diarrhea, according to “The Complete Medicinal Herbal” by clinical herbalist Penelope Ody. Cinnamon contains healthy bioactive constituents such as tannins, coumarins and volatile oils, which contribute to the spice’s antispasmodic and tonic properties. Do not use cinnamon therapeutically while pregnant, as it can cause uterine contractions, cautions Ody. In Iran, hibiscus is a traditional remedy for hypertension, according to Purdue University. Hibiscus can lower blood pressure in type-2 diabetics, according to a 2009 research study published in the “Journal of Human Hypertension.” Moreover, the plant has demonstrated efficacy against E. coli bacteria, as noted in a 2011 article in “Journal of Medicinal Food.” Scientists are studying hibiscus’s possible use to control harmful bacteria. Always seek advice from a professional before using a plant medicinally. In the traditional Chinese pharmacy, licorice has held a starring role for thousands of years. Modern scientific research is revealing many healthy applications for licorice -- it is believed to be an anti-ulcer remedy and a cancer preventative, according to a 2008 review in "Phytotherapy Research." A major constituent of licorice, glycyrrhizinic acid, has demonstrated anti-ulcer action. Additionally, the National Cancer Institute states that licorice root may prevent cancer. Consult your doctor before using licorice. 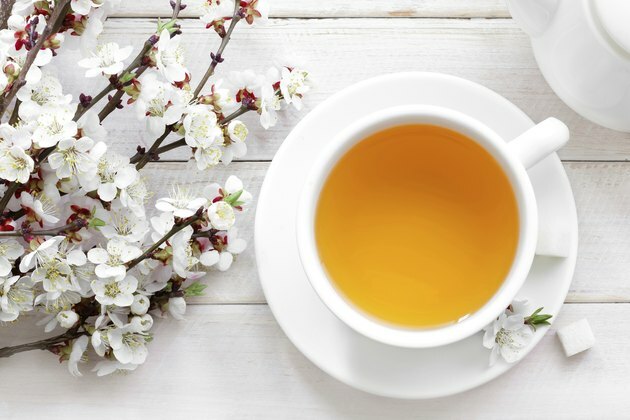 Although the above ingredients in Tazo Passion Tea may not provide you with the benefits described for therapeutic doses of each of the herbs above, its ingredients make this tea a healthy choice of beverage, either hot or iced. To soften the tea's tart taste, you can sweeten it with a little agave, which is a natural sweetener derived from the century plant and is a low-glycemic food.